John Smith's Brewery was an English brewing company based in Tadcaster, North Yorkshire. 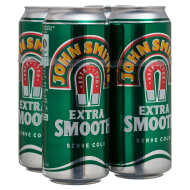 The majority of John Smith's sales are of the nitrogenated Extra Smooth product, although a cask conditioned variant is available nationally. A stronger variant called Magnet is also available in the North East of England. John Smith's Cask and Magnet are produced under licence by Cameron's in Hartlepool.